Note: Before running this program you will want to backup your web.config file (in the root of your DotNetNuke site). Also, Linq To SQL does not support the DotNetNuke object qualifier setting. DotNetNuke 5 should have a switch in the administration settings that will allow the site to run a module that uses Linq to SQL. However, there are no plans to provide this functionality in DotNetNuke 4. This program will allow you to automatically add the needed keys to the web.config file of the DotNetNuke website to allow a module that uses Linq to SQL to run. Ensure that ASP.NET 3.5 is installed on the server. 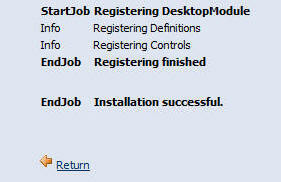 Log in as SuperUser (the Host account) and from the Host menu, select Module Definitions. Select the module installation zip file using the Browse button (Download module here) , and click the Install New Module link. After the module installs, click the Return link. 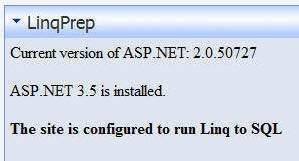 Navigate to a page in the DotNetNuke site and select LinqPrep from the Module drop-down. Click the Add link. The module will indicate if ASP.NET 2.0 and 3.5 are installed. It will also indicate if there are any keys that need to be added to the web.config file. 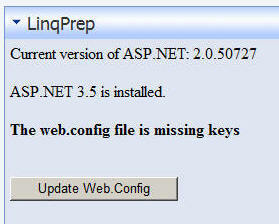 If there are, click the Update Web.Config button. The program will update the web.config file and indicate the DotNetNuke site is ready to run Linq to SQL. The program uses the normal DotNetNuke license so you can create your own version to package with your module. Do not direct your customers to this version as no support is provided. Also note that Linq To SQL does not support the DotNetNuke object qualifier setting when it is set in the web.config file.